A guide describing software to help with citation management, writing, and other parts of the research process. ​1. Go to mendeley.com to create an account. Use any email address and sign in from the MIT network to get extra storage. Mendeley recently added an option to create an account using an institutional login. This is currently not working properly. When creating a new account do not choose this option. In some cases (such as if you have a pre-existing Elsevier account), you may be forced to create your account using Touchstone. To get around this, use a non-MIT email address. You will still get the extra storage. If you do create an account with Touchstone, rather than by setting a password, you will not be able to use Mendeley desktop. Request to reset your password or contact Mendeley tech support using the email option at the bottom of the Mendeley support page. Indicate that you are an institutional subscriber. In either case, it may take several days to receive a response. 3. Add the Web Importer to your browser. 4. Search for an article in a database. 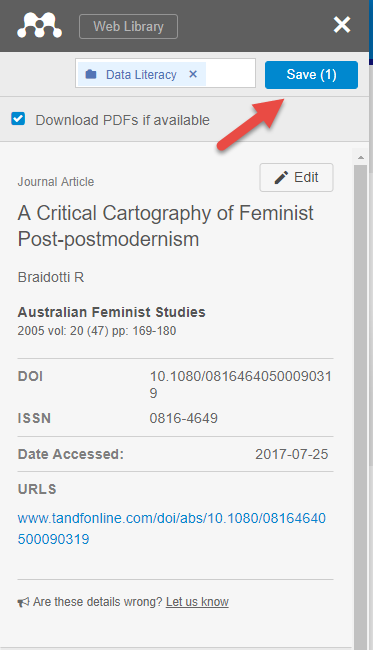 Click the Save to Mendeley button to save a citation from a website. 5. You will be prompted to sign into your account if you are not already. Mendeley will try to find the bibliographic information from that website. Choose a folder and click Save. 5. While you are writing, use the Mendeley Cite-O-Matic under the references tab in Word to insert citations and a bibliography. 6. See the Mendeley Quick Start Guide for more information. Create a Mendeley account if you do not have one. Do not choose sign in via your institution. This is not working properly. Sign into your account from the MIT network. Use the VPN if you are abroad. If you do not automatically have access to the premium features, email us and we can manually add you to MIT's account. You must log into your account using the MIT network at least once during a 12-month period to maintain premium access. You will be notified 10 days before your premium access expires. If you have graduated, you can pay for extra storage or use the storage included with a free account (2 GB). You cannot import information directly from our Barton catalog, however, the import does work from Bartonplus (this catalog searches resources in our library as well as articles from some of our electronic databases). Mendeley can automatically import citations and PDFs that are stored in Zotero. This can be a useful set up if you find that Mendeley does not import well from the databases you regularly search in.